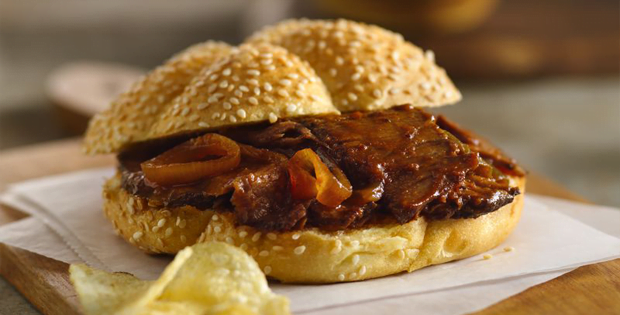 Get the exact flavorful and delicious barbecue beef without grilling. Grilling can sometimes be a pit of more work than just cooking in the kitchen with your slow cooker. For those who love using their slow cooker, I know you know what I mean. And for those you are fans of grilling but would want to try something new, here is a recipe that will allow you to enjoy a great tasting beef barbecue without having to grill it. This is a recipe that will make your weekend barbecue afternoon so easy to make and extra flavorful. 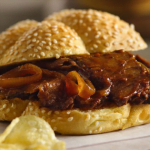 Compared to grilling, slow cooking the barbecue beef can make the beef super tender and easy to eat. Plus it helps the barbecue flavor penetrate into the beef making it explode with flavors. The best part is that you can actually put it in a sandwich making more than just a regular barbecue-flavored beef dish. So what are you waiting for, get cooking and enjoy! A very big thank you to bettycrocker.com for this amazing recipe.